The North Carolina Subcontractors Alliance (NCSA), an affiliate of the National Subcontractors Alliance (NSA), has selected its new officers for the 2018-2019 fiscal year. Past presidents, Chris Paone, Christopher Bryan Company, Duff Regan, Regan and Associates and NSA director Art Rouse. GC Council Members for 2018-2019 include Edifice, Inc, Messer Construction, Miles-McClellan Construction and Myers & Chapman, Inc. 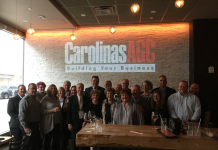 The NCSA was originally incorporated in 1976 as the Metrolina Charlotte Chapter of the American Subcontractors Association (ASA) and was later incorporated into the ASA of the Carolinas. “In 2015, upset with the financial strain of supporting a large Washington, DC based organization with a national focus, the NCSA voted to leave the ASA and in 2016 became an affiliate of the National Subcontractors Alliance,” NCSA past president Art Rouse said in a statement. Rouse said the NSA is an alliance of independent associations across the country representing over 3,500 subcontractors nationally. The NCSA provides networking events, educational meetings and seminars, general contractor access and local advocacy.